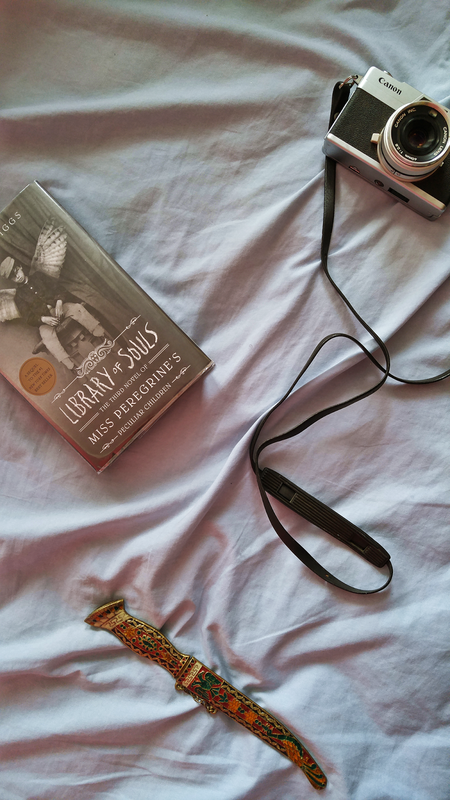 Before reading this review, make sure to check out what I wrote about the first installment of Miss Peregrine's Home for Peculiar Children as well as for the second installment Hollow City. This book took me a while to read mainly because I didn't want it to end! In other words, there were too many feels and I was too emotionally attached to Jacob and his friends to lose them to whatever horrible fate their adventure might lead them to next. In this final installment, we cross and brace ourselves as we follow brave Jacob, Emma, and Addison through high or hell water to save their friends. Picking up mid-fall off of the cliffhanger ending where we left off in Hollow City, the trio is hot off the trail of kidnapped Miss Peregrine, a few other ymbrnes and the rest of their wards, as they've been taken to the heart of their enemy's lair. Together they try to stage a rescue plan, all the while fighting for their lives as they hop loops, make friends in those who they thought were enemies and enemies in those whom they believed were their friends in order to save what's left of the peculiardom. Library of Souls was great because we got even more creepy pictures and we were introduced to more about the history and legends that make up Ransom Riggs' strange alternate world. All this in conjunction with his vivid imagery only helps to add suspense and intrigue (and a little fear) to the already action packed story. So that even as Jacob, Emma and faithful Addison, hop from the frying pan into the fire and back again, you're continually enthralled by the multifaceted villains and abysmal locations they have to confront in order to end the madness that threatens their kind as well as our own. If you like anthropomorphic bears, ancient monuments housing even more ancient curses and treasures, and portals suspended in time and space, then this series and its finale are definitely for you. But even if it's not, I'm just glad that the book answered all the question I could have had about this world and its characters' futures together. Leaving me feeling happy and sad (and honestly, still a little bit spooked. The pictures can really catch you off guard sometimes, especially if you're reading it at night.) to be finally putting a close to this fantastic adventure. “There was, in fact, a street sign to that effect—the first I’d seen in all of Devil’s Acre. Louche Lane, it read in fancy handwritten script. Piracy discouraged.